Once upon a time, not so long ago or far away, (last week; my kitchen) I had a serious hankering for a Mounds bar, but in a cupcake. A little tinkering and I came up with this sinfully delicious (see what I did there?) chocolate cupcake with a creamy, coconutty center and almond butter cream. I can’t stop eating them, and I’m afraid as soon as they are gone I will need to make a new batch and then eat them all over again. I did something unusual, for me, and used a box mix for the cake, and I wouldn’t have it any other way. Of course, you could always substitute your favorite chocolate cake recipe for the box, but it is absolutely not necessary. 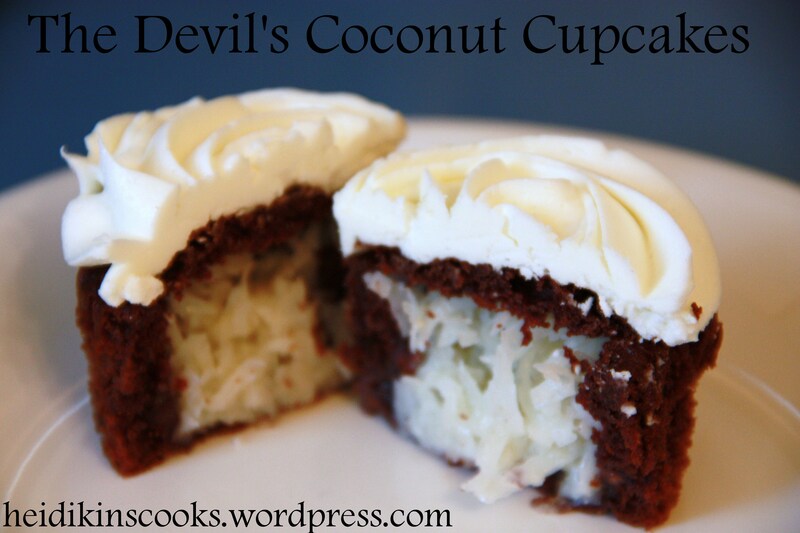 Make according to directions, but substitute the coconut oil for the vegetable oil and add chocolate chips. Line your cupcake pans with papers and spoon in the batter. Do not over-fill your cupcakes, you want them to have a flat top when cooked. Allow to cool completely. When cupcakes are cooled, take a small knife and cut out a cone shape from the inside of each cupcake. I scooped out a little extra cake for each one because I really like coconut filling. Cut the bottom off the cone shape, about 1/4″ thick, and replace on each cupcake. If you do this as you go you will not be frustrated by an impossible-to-complete chocolate cupcake-top puzzle. *I’ve cut this filling recipe in half and still had excellent results. 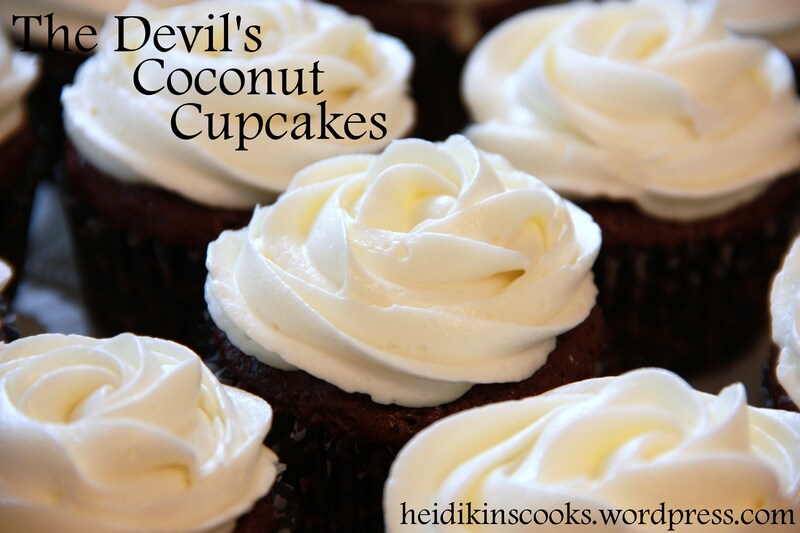 If you use more coconut and less powdered sugar the filling won’t be quite so sweet, which I think makes these cupcakes more delicious. Mix sweetened condensed milk, coconut, vanilla and salt together, thicken with powdered to desired consistency. You want it pretty thick. Whip butter, salt almond extract with electric mixer until fluffy and combined. Add powdered sugar 1/2 cup at a time and mix until well blended and smooth. Add cream or milk in increments to desired consistency. 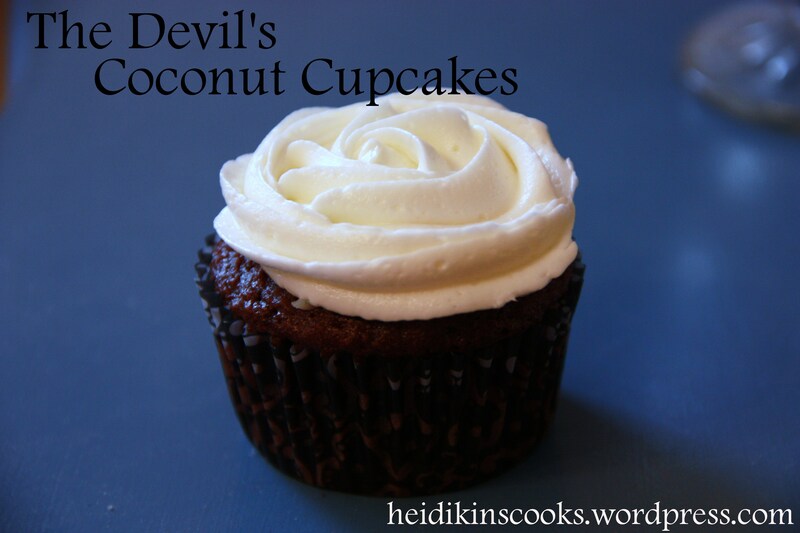 Spoon the coconut filling into each cupcake and replace the lid, top with almond buttercream. I use a pastry bag for my frosting because it is faster and easier than a knife. You can also use a Ziploc bag with one corner cut off. I used this tutorial to learn how to prettily frost cupcakes. Eat immediately. Refrigerate any extras in an airtight container, they make a delicious breakfast.